Ringing in the classroom with handbells, handchimes or belleplates contributes to the music provision of schools and has been described as the fastest growing medium for music education in the world today. But it also has a long tradition. 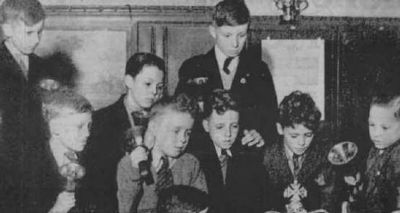 Here is a photograph taken in 1953 in Liverpool Cathedral of a group of 10-year-olds ringing handbells - Sir Paul McCartney is third from the left. This photograph belongs to Alan Holmes (who appears fourth from the right in the photograph) and appeared in the newspaper The Mail on Sunday on 4 June 2000. Click here to find out more about the use of handbells, handchimes or belleplates in schools today.